It was 2004 and I was strategically posted up next to the green onion dip and classic Ruffles, when “family friendly TV” was thrown out the window as the Justin Timberlake and Janet Jackson incident ensued! Justin is back this year, perhaps for redemption? And also Game of Thrones viewers barely blink an eye anytime skin is exposed, so clearly times have changed. However, I remain loyal to chips and dip and still want to post up for the best seat in the house! Well this year, people, I will be participating in the Whole 30 and that means no chips and dip for me! Social eating and drinking is basically dead to me for a month or so, which is definitely a challenge. I could not eat, but as Melissa Hartwig says, always have a plan! 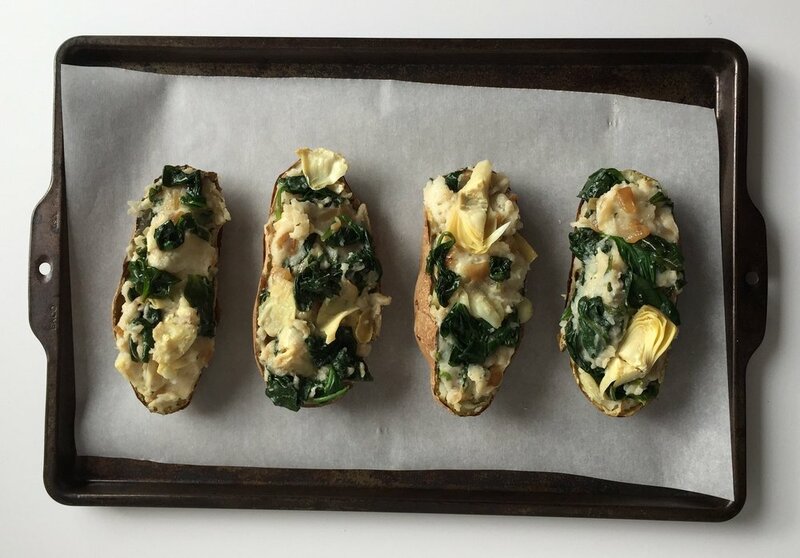 Well, not eating is not going to happen, so I created a savory, whole30 recipe that also happens to be vegan: spinach & artichoke twice baked potatoes. This recipe is the perfect Super Bowl snack for vegans, the dairy free, and whole30-ers! Coconut cream helps build a creamy, dreamy potato filling and the spinach and artichoke bulk up the filling. It plays off a bit of spinach and artichoke dip and the contrasting bite of artichokes to sweet onions, bitter spinach, and hella creamy potatoes. This recipe will not disappoint and is a great option for everyone! Indulge a little with this delicious vegan twice baked potato! Poke 3 - ¼ inch slits on the top of potatoes and place on baking sheet. *For crispier skin, rub potatoes with olive oil and season with salt before placing on a baking sheet. Bake at 400F for 1 hour, or until soft when squeezed. Meanwhile prepare the spinach-artichoke filling: In a skillet over medium heat, add olive oil, onions, and garlic. Cook onions for 4-5 minutes until translucent and they are beginning to caramelize. Add artichoke hearts and cook for 2 minutes. Add spinach and cook until wilted (1-2 minutes). Season with salt and pepper. Remove from the heat. When the potatoes are removed from the oven, carefully slice the potatoes in half lengthwise, and allow the steam to escape. Let them cool for ~5 minutes. Carefully scoop the interior of the potato into a bowl, leaving about ¼ inch rim of potato around the skin. Set hollowed out potato shells aside. Add coconut cream, salt, cayenne pepper to the potatoes. Using an electric mixer on low, mix until smooth - about 30 seconds (or use a potato masher until smooth and you have a sore arm). Add spinach artichoke mixture. Stir until combined. Refill the potato shells with a heaping mounds of filling. Sprinkle with paprika and a dash of cayenne. Bake for 15 minutes at 400F, or until the potato is warmed through and the top has slightly browned. Let cool for ~5 minutes, and serve! For leftovers, let the potatoes cool to room temperature. Store in a sealed container for up to 3 days in the refrigerator. They need a little color and a little kick. Spiced & ready to be twice baked. Serve with your favorite splash of hot sauce for extra kick! Or even a cool green dressing to bring down the heat. Coconut cream will congeal in cold weather. Shake the can before opening. If there are a lot of solids, use 1 part solids: 2 parts liquid for the 1/3 cup of coconut cream. Add more if you want smoother potatoes. If the spinach mixture is watery, tilt the pan and drain liquid before adding to potato mixture. Don't like spinach? Use other veggies like bell peppers, carrots, mushrooms, zucchini, etc. Cook it down to avoid a watery potato.